Caliban: [to Prospero] I though I'd find you here. It's time to come home, my son. Caliban: You've changed...yes, you've been reborn. Just as I anticipated, you were amongst the meat you could not resist, and now, we'll be together. Caliban: Your heart's not in this, boy. I've watched too many movies in my time. I mean, here I am, commenting on Trancers 4 - TRANCERS 4! - and I bet this review will be read by a grand total of about six people, the same six people who rented this silly little movie when it came out. For the uninitiated, Trancers started life as a futuristic film noir series. Well, to be brutally honest, it started life as tacky B-movie trash with noir ambitions. The lead character, Jack Deth (like Death, geddit?) was played by lovable genre grump Tim Thomerson, who has achieved a semi-legendary status on the order of Bruce Campbell's. Are either of these men really titans of the entertainment industry? Nah. They're weirdos and underdogs. And that's why we love them. 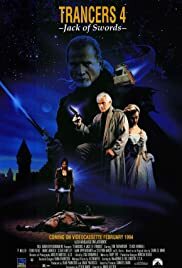 Trancers 4 departs from the series' usual detective theme and plants Jack Deth in a medieval fantasy world populated by energy-draining vampires. Purists have cried foul over this, but what the hell - Full Moon had a sweet deal, filming on the cheap in Romania, and they wanted to re-use their forest and castle locations from "Subspecies." So, comic book writer Peter David was called upon to plunk Deth right into the middle of an old "Doctor Who" plot involving tyrants, rebels, swordplay, and lots of running around in the woods. The connection to "Who" is strengthened by the endearingly absurd special effects (or, better put, special defects). The rebel characters are woodenly acted, the bad guys ham it up like loons, the fight scenes are listless, the plot makes no sense - oh, I could go on and on - and yet this movie is still boss, precisely because it's cheap and crass and ballsy and not in the least bit mainstream. This is the kind of movie you could make in a weekend with your friends, and it's all the better for its crudity. It's just so much fun - I mean, c'mon, Deth dunks some guy's head into a bowl of popcorn! He turns an android's head into a bedside lamp! He talks and acts tough, but he's clearly WAY TOO OLD to threaten anybody! It rules. It just rules.